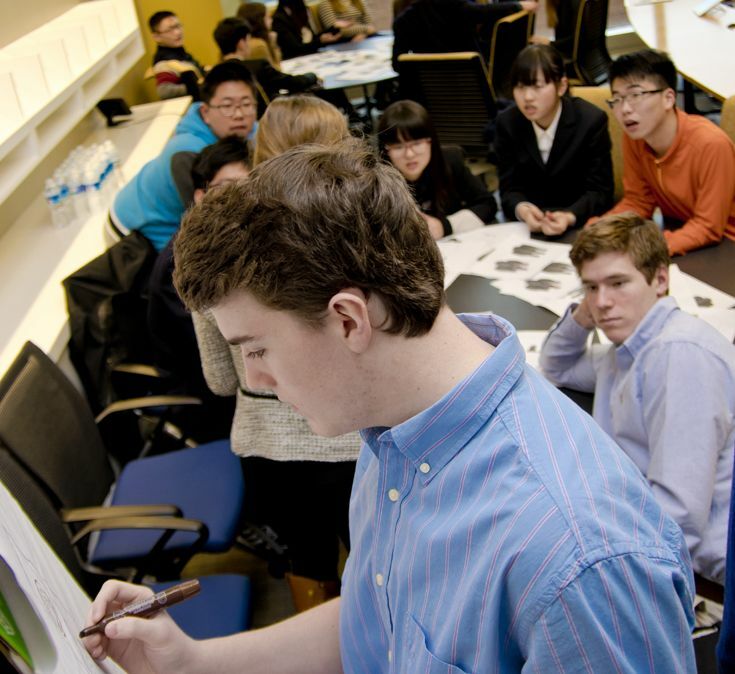 Collegiate School is committed to providing a challenging college preparatory curriculum. Within this framework, the school uses targeted strategies and a variety of resources to support students identified with significant learning differences. In this effort, a strong partnership among teachers, consultants, tutors, parents and students is essential for success. The focus of this partnership is the creation of learning environments that are sensitive to different learning styles and encourage students to develop strategies for academic achievement. In the Upper School, the learning specialists in Academic Services work directly with students to develop and improve the use of learning, organizational, and self-advocacy strategies. Some students may also work with learning specialists to improve their abilities in reading, writing, and mathematics. Students are referred to Academic Services through a process involving teacher referrals, periodic reviews of academic successes and challenges, and parent/student concerns. The learning specialists then create and implement a customized plan for students to accomplish goals. The overall goal is to empower students to become independent in their successful use of strategies in preparation for college. Learning specialists work individually or in small groups with students. Students can schedule times to meet with a learning specialist during the early morning help time, study hall periods, or any other open periods during school hours. Learning specialists in the Upper School work with students, teachers, parents, counselors, and others in a collaborative process to improve student academic performance. Teachers communicate and collaborate with the learning specialists on the implementation of classroom techniques and strategies, accommodations, and student progress. This collaborative process allows students to gain confidence in their self-advocacy abilities in order to become more proactive and successful. Upper School learning specialists collaborate with students and teachers using research-based and brain-based best practices for improving the academic abilities and performance of students. Collegiate School provides a variety of academic accommodations that are customized by a learning specialist for students with diagnosed learning differences, physical impairments, medical conditions, and other impairments. In order to receive accommodations in the Upper School, students are required to have a comprehensive evaluation on file that is no older than five years from the date of the evaluation. Learning specialists also work with students and parents to apply for appropriate accommodations with The College Board (PSAT, SAT, and Advanced Placement tests) and the ACT. Learning specialists collaborate closely with College Counseling for students who may continue to need accommodations in college. Academic Services also works with students to prepare documentation to be presented to college accommodations offices. Parent programs are scheduled by Academic Services to address questions and concerns related to the transition to college for students requiring accommodations.